By Vincent Morgan	| Published on Tuesday, April 6, 2010. FC: Where are you from Belin? Tell us about your beginnings, and your discovery of graffiti. I´m from the south of Spain, I was born and grew up in a town named Linares. Graffiti began to be popular in 1995 in Linares, because people from other cities came to visit their families and painted there. For me that was very interesting. FC: Tell us about the graffiti scene in Linares. 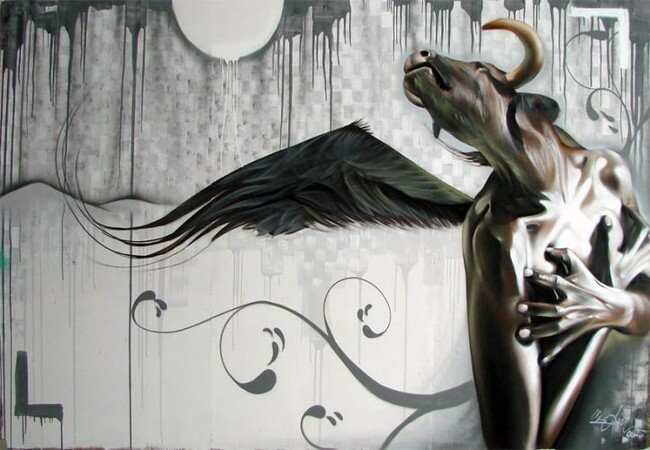 It has evolved a lot and I think that it is becoming a point of reference to “graffiteros” over the world. FC: What's the meaning of your name? 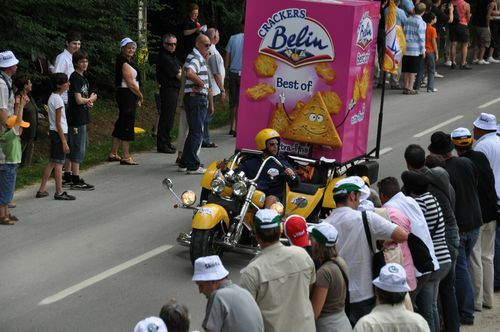 In France, it's a biscuit brand for aperitif! FC: What do you like in graffiti? Mostly I like to have fun painting with my friends, travelling, meeting new cultures and painting styles, and of course meeting new people. FC: How would you define your work and what inspires you? FC: What crews do you rep? Who are the other members of your crew? FC: Can you tell us what are your best album, best movie, and best book? FC: Name an artist (or many) whose work you respect and admire. 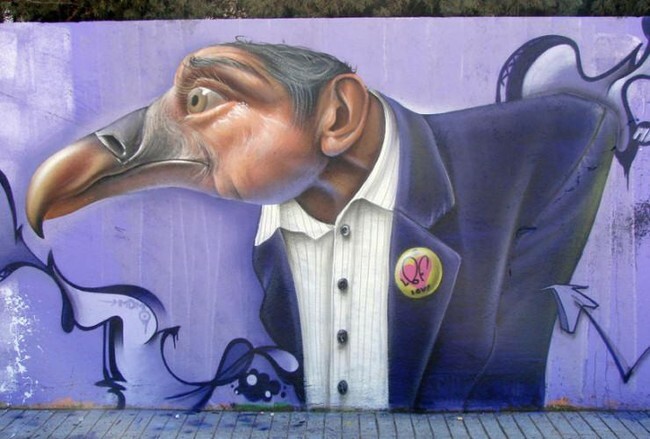 Picasso , Dali, Suso33, Ske. FC: If your style was a music band or a song? Which one would it be? FC: How do you organize your paintings? What are the different steps? I think of an idea, I take some pictures or look for in my countless files, I use photoshop, make sketches, but usually I'd rather improvise. FC: During the Hip Hop Dôme Jam in Bondy, you only used a photography of your friend to paint your piece. So we first thought that you were doing a realistic portrait, but you ended up painting something more between the caricature and the surrealist portrait. Is it the Belin Style? No, Belin can do realism and caricature, and of course anything more if I feel it in the moment. Everything influences the story of the character. It is not the first portrait of him. My models are from my entourage, I feel what I want to paint at the moment, and choose "the one" according to the feeling. FC: Did you ever do letters before characters? 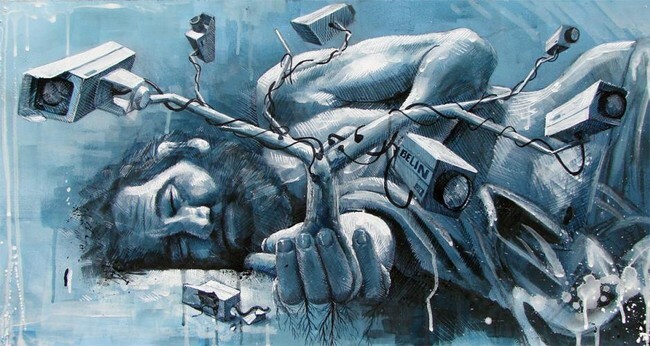 Classical graffiti piece? FC: What was your most adventurous and dangerous graffiti? 4 months ago, while moving a scaffolding, it fell down. We have been lucky. The ground wasn't too much though. It always has sense, it is never unreal. FC : How's the collaboration with other artists going? I paint with many people, I like to have fun, that's the whole point. I paint with Otes, although we don't live in the same town, but it's ok, we're close. From all the places I have visited, I brought a very good experience. FC: In which way do you want your art to evolve? Really I don´t know. I will keep painting until I die, I am not sure what is my finish line and I am very happy with my art. Everyday I paint in my studio, working on something new, but really I don´t have a schedule, I can finish late as well as not. Usually I can not see my children. I wake up at 8 a.m., I take my children to the elementary school, walk to my Studio and start to work there. Most of the days I have a late lunch, and start to work and start to work again in the afternoon. Those things only change when I am on a trip. Lateley I have been painting and making sculptures more than graffiti because there has been a very bad weather. With the spring, graffiti will be coming back. FC: Your favorite time to graff? FC : A list of words that represent Graffiti. FC: Have you been arrested for graffiti ? 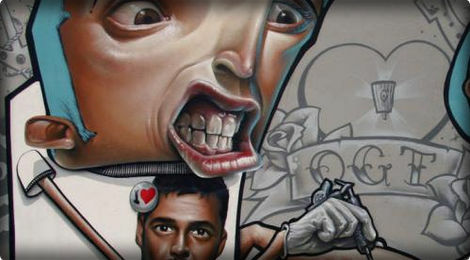 Belin will travel much more to represent his art all over the world. Hopefully I will be like this for the rest of my life. FC: What's your real goal? That many people know my art because I´m working a lot to improve it.